Jim Gessner of the "Solid Axle Corvette Club" sent me these photos. Appropriate to the theme of 2002's "Monterey Historics"! 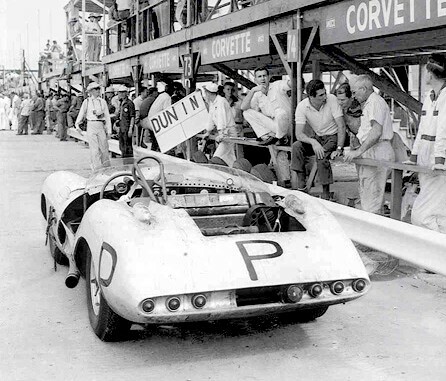 The Corvette SS "Mule" at Sebring in March, 1957. This test version of the "SS" became the prototype of the Corvette Sting Ray. Note Zora Duntov in the middle talking to John Fitch and Frank Burell. The pit sign indicates that Duntov was out on the track in the car himself. Great photo! 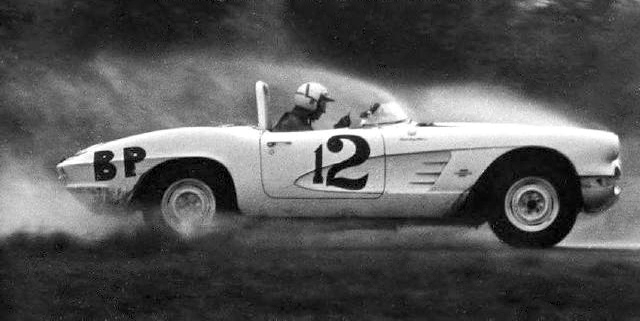 Don Yenko in the rain in his 1961 Corvette. Does anyone know where and when this photo was taken? Nick England, who operates an excellent site on the history of "Virginia International Raceway", says: "I'm pretty sure that photo was taken at VIR in April 1962." "On your Corvette pages, you have a photo of Don Yenko in the rain at VIR. That was during the NE Divisional at VIR on October 4, 1964. Yenko borrowed some street Michelins from a spectator and dominated the final race on the program, winning overall. The photo is by John Ewald and is particularly striking as the spray pattern looks much like a smoke test in a wind tunnel. I was press director for this race and Mr. Ewald was shooting for me. 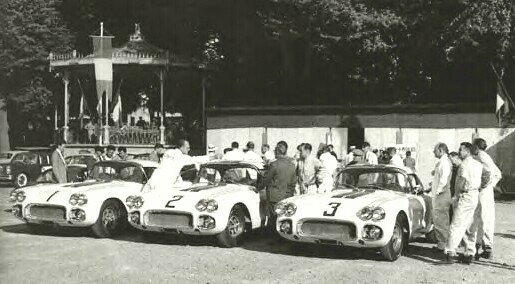 - Bill King"
The three Corvettes entered at LeMans by Briggs Cunningham in 1960. A never before seen photo till just recently. "I am considered by some a Corvette historian and have been in the hobby since 1969 when I bought my first Corvette, a 65 fuel injected coupe. Now, 56 Corvettes later, including a B/P 64 race Corvette, I am retired and am having more fun now than ever. If people are looking for Corvette race cars perhaps I can help. I know where many are and all their histories.